From the Thor Ragnarok Pop! Vinyl collection by Funko. Thor Ragnarok Hulk Helmeted Gladiator Pop! Vinyl Figure #241. This Item is in stock and ready to ship. You should not postpone your purchase and miss out on adding Thor Ragnarok Hulk Helmeted Gladiator Pop! Vinyl Figure #241 to your Thor Ragnarok Pop! Vinyl collection! From the Thor Ragnarok Pop! Vinyl collection by Funko. 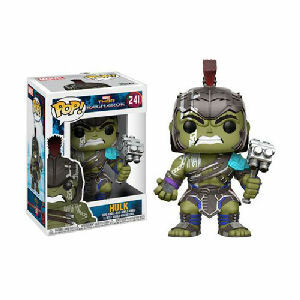 Thor Ragnarok Hulk Helmeted Gladiator Pop! Vinyl Figure #241. Measures 3.75 inches high. The sylized figure has a rotating head and comes in a displayable window box. Funko The Mighty Thor Pop! Vinyl shipping from Canada. No Surprise Border fees or Customs!